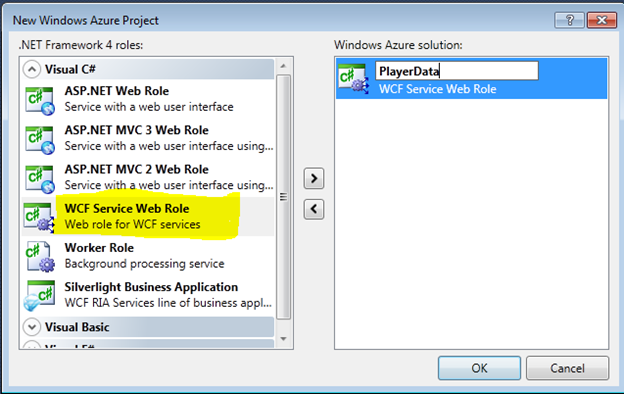 First of all, create a project in Visual Studio, choosing WCF Service Web Role from the Cloud tab. We are going to return list of Players from the Service as XML and JSON. For that add a class to project called Players and attribute it as DataContract. Below I am creating Players class and attributing the class as DataContract and all the properties as DataMember. There are two operation contracts. GetPlayersXml function will be returning XML as response. GetPlayersJson function will be rturning JSON as response. Using WebGet attribute REST behavior has been enabled on the Operation Contracts. Country ="India", Name="Sachin Tendulkar",Sports ="Cricket", ImageUrl="sachin.jpg"
Country ="India", Name="MS Dhoni",Sports ="Cricket", ImageUrl="dhoni.jpg"
Country ="Australia", Name="Rickey Ponting",Sports ="Cricket", ImageUrl="rickey.jpg"
Country ="India", Name="Sandeep Singh",Sports ="Hockey", ImageUrl="sandeep.jpg"
In service implementation I have created a function named GetPlayers(). This function is returning List of Players and calling same function in both function GetPlayerXml and GetPlayerJson. This is what all we need to do to create a WCF REST Service to be hosted on Windows Azure. Press F5 to run and test WCF Service Web Role in local development fabric. Make sure that you have set Windows Azure project as startup project. 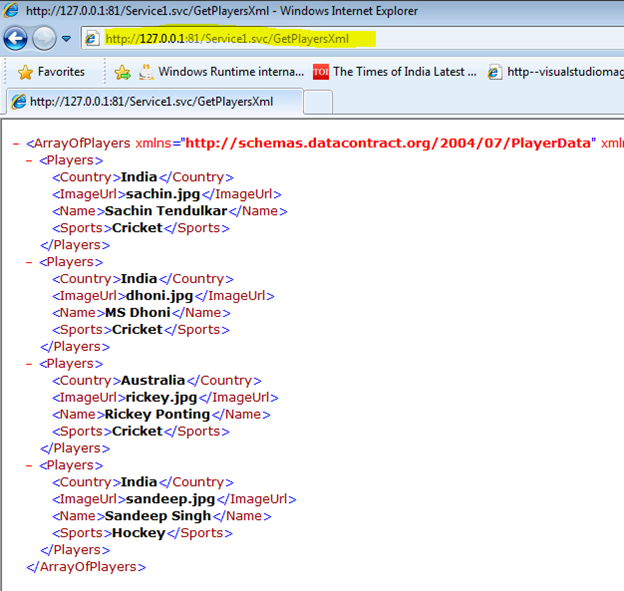 You can see that Players data as XML is accessible at baseaddress/Service1.svc/GetPlayersXml. Since currently we are running WCF Service Web Role in local azure emulator so base address is IP address of localhost at port 81. Next after testing locally you can deploy service at Windows Azure. For that right click at Windows Azure project and select Package. 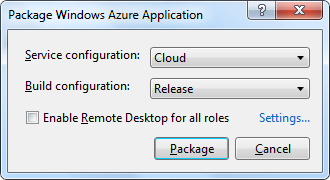 Next choose Service Configuration as Cloud and Build Configuration as Release and click Package. After successful package you can see Service Package File and Cloud Service Configuration file in the folder explorer. We need to upload these two files to deploy application on Microsoft Data Center. And later upload this package in Windows Azure Hosted service to host created WCF Service Web Role in Windows Azure. In this way you can create a WCF REST Service and host in Windows Azure. I hope this post is useful. Thanks for reading.